Harold S. Bender (born 19 July 1897, died 21 September 1962) was one of the dominant Mennonite personalities between the years of 1930 and 1962. He remains best known for his essay, "The Anabaptist Vision" (1944), in which he set forth his vision of faithful disciples gathered in the name and spirit of the Christ of peace. This vision permeated Bender's life and thought. Bender was born in Elkhart, Indiana to George Lewis and Elsie (Kolb) Bender. At the time, Elkhart was at the hub of the Mennonite Church (MC), thanks to John F. Funk's periodical, Herald of Truth, and the other programs in publishing, relief work, mission work, mutual aid, and education that developed there in the 1880s and 1890s. Bender graduated from Elkhart High School (1914), Goshen College (Bachelor of Arts, 1918), Garrett Biblical Institute (Bachelor of Divinity, 1922), Princeton Theological Seminary (Master of Theology, 1923), Princeton University (Master of Arts, 1923), and the University of Heidelberg (Doctorate of Theology, 1935). He attended the University of Tübingen, 1923-1924. In 1923 he married Elizabeth Barbara Horsch; their children were Mary Eleanor and Nancy Elizabeth. Bender taught one year at the high school in Thorntown, Indiana (1916-1917) and two years at Hesston College (1918-1920). From 1924 to 1962 he was professor at Goshen College in church history, Bible, and sociology. He was dean of Goshen College, 1931-1944, and dean of Goshen College Biblical Seminary, 1944-1962. Bender's birth coincided with the Mennonite renaissance or awakening of the 1880s and 1890s, which was, in part, the result of a shift in language from German to English. 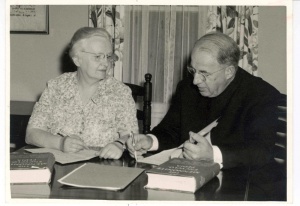 Mennonites during this era began accepting much within their new English-speaking, North American culture, including higher education and a renewed interest in missions, at home and abroad. Bender's own interest in education should be understood in this light. Bender's formative years, on the other hand, came during the time of a new era of Mennonite Church (MC) leaders who attempted to establish a new Mennonite orthodoxy, in doctrine and dress, with a certain codification of both, and imbued to some degree by Fundamentalism. Daniel Kauffman was the major leader at the time (ca. 1898-1930). His Manual of Bible Doctrines (1898, 1914, 1929) became the definitive word for many within the church at that time. The significance of Bender's work may, in part, be seen in terms of how he dealt with these new trends, both Fundamentalist and Liberal, within the church. Bender chose a route and approach to vision that differed from both. It stood in contrast to the Kauffman view of doctrine and dress, not so much in criticizing it directly, but rather by circumventing it. Bender chose to express the Christian faith through the historical process and attempted to rediscover the Anabaptist vision of biblical faith and life. Bender believed he was not creating a new theology but was returning to and recovering an old faith, the faith of his own forebears. In 1927 he created a journal, Mennonite Quarterly Review (MQR), and in 1929 he founded a scholarly series, Studies in Anabaptist and Mennonite History, writing the first volume himself (Two Centuries of American Mennonite Literature). Bender's writings clearly indicate the scope of his efforts to bring about a return to the Anabaptist faith as he understood it; he wrote a dissertation on Conrad Grebel, one of the founders of Anabaptism (1935, published 1950); a biography of Menno Simons (1936); Mennonite Origins in Europe (1942); "The Anabaptist Vision" (1944); Biblical Revelation and Inspiration (1959); These Are My People (1962). He was also an editor of the first four volumes of The Mennonite Encyclopedia (1955-1959). Throughout all these decades he edited the MQR and published many shorter essays in that periodical, as well as in other scholarly journals and in church papers. Bender's leadership in the life of the Mennonite Church (MC), worldwide Mennonitism, and in ecumenical contacts was evident, in part, through the long list of committees and organizations in which he was active. Central in Bender's vision was his concern for the way of peace and love as integral to Christian life. Bender, Harold S. "The Anabaptist Vision," Church History 13 (March 1994): 3-24, reprinted in Mennonite Quarterly Review 18 (April 1944): 67-88 and in Hershberger, Recovery, 29-54. Crous, Ernst. "Harold S. Bender," Mennonitische Geschichtsblätter 20, Neue Folge 15 (1963): 2-8. Gospel Herald (15 September 15, 1987): 649-654. Hershberger, Guy F. , ed., The Recovery of the Anabaptist Vision. Scottdale, 1957. Hershberger, Guy F. "Harold S. Bender," in A Cloud of Witnesses, ed. by J.C. Wenger. Harrisonburg, Va.: Eastern Mennonite College, 1981. Keim, Albert N. Harold S. Bender, 1897-1962. Scottdale, Pa.: Herald Press, 1998. Mennonite Encyclopedia IV, "Biographical Notices of Editors," 1149. Mennonite Quarterly Review 38 (April 1964), special memorial issue. Springer, Nelson and A.J. Klassen, eds., Mennonite Bibliography, 1631-1961, II. Scottdale, Pa.: Herald Press, 1977: 420, entry no. 227. Warkentin, A. and Melvin Gingerich, eds., Who's Who Among the Mennonites. North Newton: Bethel College, 1943: 21-22. Harold S. Bender collection, MC Archives (Goshen). Gross, Leonard. "Bender, Harold Stauffer (1897-1962)." Global Anabaptist Mennonite Encyclopedia Online. 1990. Web. 21 Apr 2019. http://gameo.org/index.php?title=Bender,_Harold_Stauffer_(1897-1962)&oldid=148865. Gross, Leonard. (1990). Bender, Harold Stauffer (1897-1962). Global Anabaptist Mennonite Encyclopedia Online. Retrieved 21 April 2019, from http://gameo.org/index.php?title=Bender,_Harold_Stauffer_(1897-1962)&oldid=148865. Adapted by permission of Herald Press, Harrisonburg, Virginia, from Mennonite Encyclopedia, Vol. 5, pp. 66-67. All rights reserved.